From the correction low in early October 2006, gold has shown increasing technical strength as each new 13-week trading cycle unfolds and lifts the metal higher. This sequence of improving prices gives a good indication of expanding strength and also helps forecast the movement of this precious metal over the next few months. With a new 13-week trading cycle developing in the first half of April (see the lower portion of Chart 1), a price peak can be anticipated mid-point (second half of May) at a level of near $720. The next trough should form in late June. Institutions and investors are climbing aboard as greater interest emerges in molybdenum. The silvery white metal adds anti-corrosive properties to everything from pipelines and power plants to desalination plants, automotive parts and air pollution systems. Find out if the project has permits before jumping into the moly mania. We interviewed Adanac Molybdenum executive chairman Larry Reaugh about the dozens of junior resource companies, which now proclaim they are part of the Molybdenum Bull Market. His company appears as a potential molybdenum producer on the horizon. Sean Brodrick writes :Boy, I sure hope you're holding some uranium investments … because at the latest auction for the white-hot metal, the spot price of uranium oxide (U3O8) soared $18 to $113 per pound! That's a 19% rise in just one week. According to Nuclear Market Review , it's the largest single weekly price increase since uranium has been tracked! You ain't seen nuthin' yet! Molybdenum plays a more vital role in the global nuclear renaissance than you might suspect. Without the silvery white metal, the world's energy infrastructure would somewhat suffer. 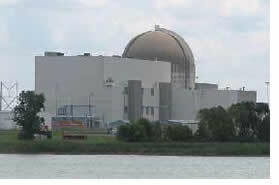 But, nuclear power plants would be set back at least two decades. The new high performance stainless steels (HPSS) contain as much as 7.5 percent molybdenum and can add more than three times the life to the world's aging nuclear fleet condenser tubes. Gold put in another good week closing up $10.40 to $679.40 (+1.55%). This was gold's highest weekly close in 6 weeks, and was the daily high close for the week as well. Gold's next target is the Feb. high of $686.70 on a closing basis and $692.50 on an intra-day basis. From there the next target is the multi-year high of May 2006 at $730.40 (intra-day). All is not well in the oil market. Not simply because of the demand supply pressures. Oil supplies, to a large enough extent to exert overwhelming pressure on the oil price, reside in nations that are not only involved in conflict within themselves over their own branches of Islam, but in nations that are thoroughly disposed to loathe the West, particularly the U.S. of A. Now add to that the wealth they themselves have in their pockets, which is sufficient to influence the flow of the U.S.$ market to its detriment, a market that is already under pressure from an over issuance of the currency to support the bleeding Trade deficit now at destructive proportions, and the potentially overwhelming surpluses in the hands of all the nations of the world. Our interview with Glenn Catchpole of Uranerz Energy explains what investors should know about water's role in ISR uranium mining. Companies with an ISR project may disappoint shareholders because of the water location, or lack of water, in relation tothe ore body. As part of our efforts to better educate not only uranium stock analysts and investors, but also the media and environmental groups, we have expanded upon last year's introduction to In Situ Recovery uranium mining with our Advanced ISR Series. Water plays an integral role for In Situ Recovery (ISR) uranium mining. If the water is not in the right place, ISR mining can not take place. A company's ‘pounds in the ground' are nearly worthless or may have to be extracted through other means. Where's the Beef?? It Better be in Your Freezer - Several different things I want to address first before getting to analysis of the HUI. The first one has to do with meat. The governments do not include the price of food or energy in the core rate of inflation (soon they will be including those that lie in graveyards into their index to further “average” the price down I am sure of it) so everything that you or I have to buy in the grocery store no matter how much costs rise is not “their definition of inflation”. This is the government's way of hiding the volumes of money being created out of thin air. The coming of Peak Oil is causing a movement in the US to produce ethanol in order to provide an alternate fuel source. The big corporations are pushing for corn because it is big money. Use of straw grass, sugar beets etc. is far more efficient in the energy balance of the production equation. Petroleum prices have started racing to $70 a barrel after staying below $60 for the better part of the winter, now coming to an end around the world. What does this portend? Does it signal that the good times are over and recession is about to be triggered in America and a number of advanced countries? The housing boom in the US is beginning to bust and a crisis is looming on the horizon. This has already created a degree of concern, if not alarm, around the world, including India. How does it affect India and the rest of the world? Because the US dollar value is being eroded and the rupee, yen, euro, Chinese and several other currencies are being valued upwards, there is an implied cushioning of the high petroleum prices, but exporters are losers in cheaper dollars as they earn fewer rupees. The worst affected are the outsourcing companies engaged in providing information technology through service centers as well as call centers, which cover a wide spectrum of the industry. There is no shortage of commentary in financial newspapers, hemming and hawing over such matters as GDP growth, or the CPI data, or even the same store sales of major retailers. The fact of the matter is that all such releases are virtually worthless since their unit of measure being reported is in a fluctuating measure that is constantly changing – the US dollar; (or any other paper currency for that matter). It is akin to weighing yourself on a bathroom scale but allowing the amount of ounces in a pound to constantly fluctuate. What good would that kind of data be to anyone? Yet this is precisely what analysts and commentators debate with constantly in the financial press and on stock market shows such as CNBC. Sean Brodrick writes : If you knew about an investment that, by conservative estimates, would increase in value 47% in the next 18 months, would you buy it? Well, today I want to tell you about such an investment — uranium. Heck, just a few months ago, I said uranium would hit $100 per pound by the end of this year. It looks ready to hit that target this month ! In just the past year, the white-hot metal has surged 137% to $95 per pound. That's far beyond the expectations of most market analysts. So now they're rolling out new estimates — higher and higher. AS THE TREND for spot gold prices to move higher rolls on, the big gold mining companies keep racing to re-stock their shrinking reserves. Three of the larger gold miners just said they're going to spend record sums trying to find new gold-in-the-ground. Trying to pick the winners – and selecting junior miners on the brink of receiving a hot takeover bid – might just pay off handsomely. But don't neglect the bigger picture as you chase these short-term M&A profits. "Route One" to growing proven and probable reserves in the ground is more than likely to eat up total exploration budgets in 2008 and beyond. Commercials are recent buyers of the VIX. Thus far, the setup looks more neutral than anything else. A classical COT setup to the long side would result if net-commercial position rose near or above 4,000 contracts. Last week I mentioned that the VIX looked overextended to the downside and would probably retest its 10-day moving average (MA). Over the next several days, the VIX did indeed rally and is now trading above its 10-day MA in the 14 to 16 dollar range. With the bullish setup in the stock market right now, I would expect the VIX to decline over the next little while, and ultimately end up under $12. However, if we see the VIX rallying and closing above $16, that would tell me that volatility decided to stick around. Speaking of which, a move above $16 for the VIX would probably also translate into further weakness in the stock market. Permitting a uranium mine requires more than a simple application to mine. And, as we discovered, the process can take between three and six years (sometimes even longer), costing several million dollars and requiring numerous scientific studies on a company's property. This could add additional pressure to uranium prices. Few investors and analysts have a firm grasp of the length of time environmental studies and the approvals process requires. Having visited numerous investor forums, we realized many investors believe a property is drilled and then mined, after a brief permitting period. Quite the opposite is true, as explained to us by Richard Blubaugh, environmental manager for Powertech Uranium. Gold had a good week rallying up $11.70 to close the week out at $669 (+1.78%). It was the highest daily close of the week and the highest weekly close in 5 weeks. 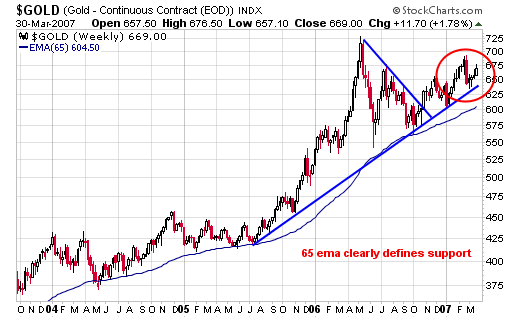 The weekly chart below clearly distinguishes the long term trend line that continues to remain above its 65 week moving average. The rising trend line has support at just under $650.00, while the 65 ema comes in at $604.50. An increasing number of goldbugs and traders are getting bewildered and frustrated at gold's pedestrian performance and refusal to break higher, even with a possible attack on Iran looming, especially as oil has been romping ahead, and are, of course, looking around for people to blame, which usually winds up being the poor old cartel, those dastardly faceless individuals whose job it is to suppress the price of gold and silver so that the financial world at large doesn't cotton on to the precarious state of the world financial system in general and the Fiat money system in particular, much less mortgaged-up-to-the-hilt Joe Sixpack, whose chief distinguishing feature is that he hasn't got a clue about anything, apart from the details of upcoming ball games etc. Imagine a teeter-totter. On one end is inflation, and on the other, risk of a recession. It remains to be seen which side will grow heavy first and force the Fed's hand. Other than Monday, the week's daily gold trading activity closed either lower on the day or at the low of its daily trading range. Not activity fraught with confidence. In my tables of technical information and ratings (at the end of these commentaries) is a column called RATE for Technical Rating. Based upon the technical information in the table I had developed a program that then took this information and tried to determine if the stock or Index is technically bullish (POS), bearish (NEG) or neutral (N).